Unless it's serving an architectural purpose in a sushi roll, most Westerners don't think of seaweed as food. But humans have been eating seaweed since prehistoric times, and it's still consumed daily in places like Japan, China, and Korea. So what do these Asian countries know that we don't? You've heard of probiotics, the good bacteria found in foods like yogurt that help keep your gut healthy. Well, prebiotics are essentially fuel for probiotics: special plant fibers that nourish the good bacteria that are already there. Seaweed is rich in polysaccharides that function as prebiotics, and therefore it can help keep your gastrointestinal tract -- and anyone you share a bathroom with -- happy. Seaweed, especially red varieties such as nori (the kind most sushi chefs use), is a terrific source of protein, which is great news for all of us but especially for vegetarians and vegans. Our meat-eschewing friends will also be glad to hear that this sea vegetable is one of the few non-animal sources of vitamin B12, an important nutrient that assists in the maintenance of nerve and blood cells, helps make DNA, and protects against anemia. With heart disease still topping the list of the leading causes of death in the United States, we could all stand to give our hearts a little more love. Snacking on seaweed is one way to do that, due to its antioxidants and "healthier salt" content. It's one of the foods most frequently recommended for those with high blood pressure, and some studies show that eating seaweed could help prevent cardiovascular disease. Thanks to the advent of iodized salt in the 1920s, and subsequent efforts by the World Health Organization to make it universally available, the incidence of goiters and other horrifying symptoms of iodine deficiency has decreased dramatically. Despite the great strides made in reducing iodine deficiency, millions of people still don't get enough of it. Luckily, seaweed is one of the best food sources of iodine out there. If you can overlook the fact that most of your food grows in the dirt, then surely you can accept a little algae in your life. Plus, they're yummy. There's even a type that tastes just like bacon -- really. And seaweed's not the only algae you'll find on supermarket shelves. Spirulina and chlorella are two types of algae powder that you can sprinkle into smoothies or take in capsule form. A good way to get your feet wet with seaweed (see what I did there?) is to order sushi, miso soup, or seaweed salad at your local Japanese restaurant. Feeling adventurous? Up the ante and make your own sushi at home. 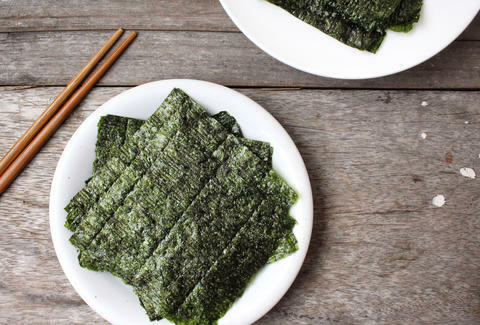 If you prefer to keep it simple, snag some "seaweed snacks" at your grocery or health-food store. (Trader Joe's has its own ultra-cheap version.) These are typically sheets of dried, roasted seaweed you can eat like chips -- but with way less guilt. And if you should ever find yourself in Hawaii, eat this immediately. Katie McDonough is a freelance writer and editor who got on the seaweed train years ago and is never getting off. Follow her @thewritekatie.